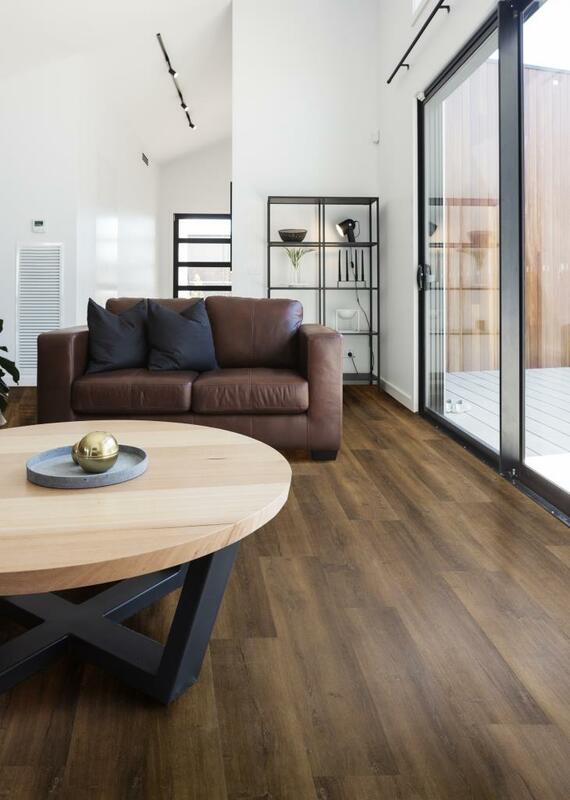 The new Tru-Wood Atroguard range of flooring from Traviata is engineered to perfection. Key to its performance is the remarkable stability of the board. This is achieved through the high density “Sure Core” core board. The core utilises a higher percentage of long fibre softwood in its construction giving greatly enhanced resistance to both moisture and temperature. The result is that Tru-Wood can be installed in areas four times larger than normal laminates without the need for expansion profiles. The high density core combined with a two pass “Power Seal” coating and tight lock joint system also results in a highly water resistant floor. 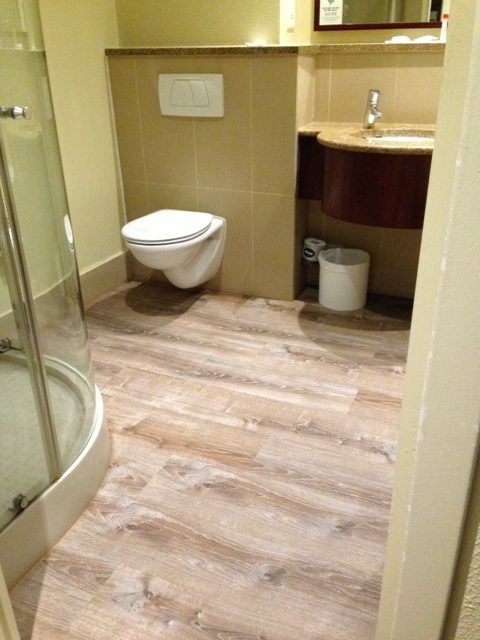 Tru-Wood can be wet mopped and is suitable for use in wet areas such as bathrooms and kitchens. Add to this the very scratch resistant, full commercial grade AC5 surface and you have a product that is suitable for use in all hotels, restaurants, shops, offices and public buildings. 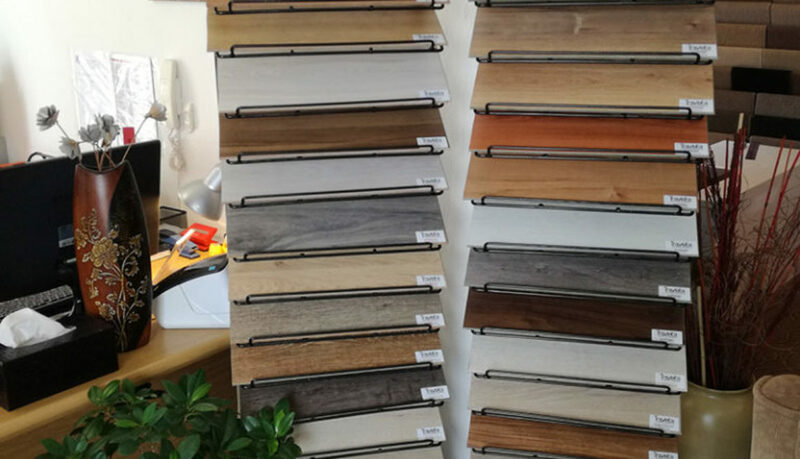 The high number of visuals per décor and large plank format offers all the uniqueness and beauty of real wood with none of the disadvantages!! Finally it’s here – a floor for your home that’s fit for when life happens! Imagine a floor that’s water proof, pet friendly, highly scratch resistant and can be used in any room in the house – even in direct sunlight. 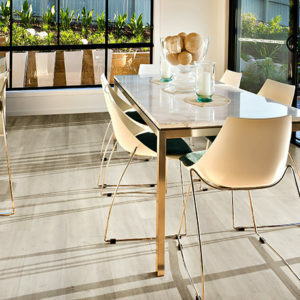 It’s called Firm Fit from Traviata Flooring. With Firm Fit the magic is in the make-up ! The limestone based core imparts features and benefits long sought after in LVT flooring. The core is twice as stable as normal LVT and three times more rigid. What this means is that it can be laid in areas of 400m2 without the need for expansion joints, can be laid in direct sunlight and will never peak or telegraph sub-floor imperfections. The high density core also means that it has ten times the impact resistance of e.g. a WPC floor and can withstand three times the static load. Added benefits include that the joint strength is greatly enhanced and sub-floor preparation is not as critical as with other LVT products. Either side of the core are a quartz enhanced Urethane wear layer which is highly scratch and scuff resistant and a cork backer for added comfort and sound reduction. Add to this a deep structured decorative layer and you have the look and feel of a premium hardwood floor that is “Fit for Life”. Firm Fit contains no plasticisers, no Ortho Phthalates or other harmful substances, is 100% recyclable and conforms to all European standards for emissions and indoor air quality. Some 15 years ago Traviata Flooring came into being selling one range of laminate Flooring using hand written invoices. Today they are one of SA’s leading importers of flooring products supplying world leading technology into a number of sectors. 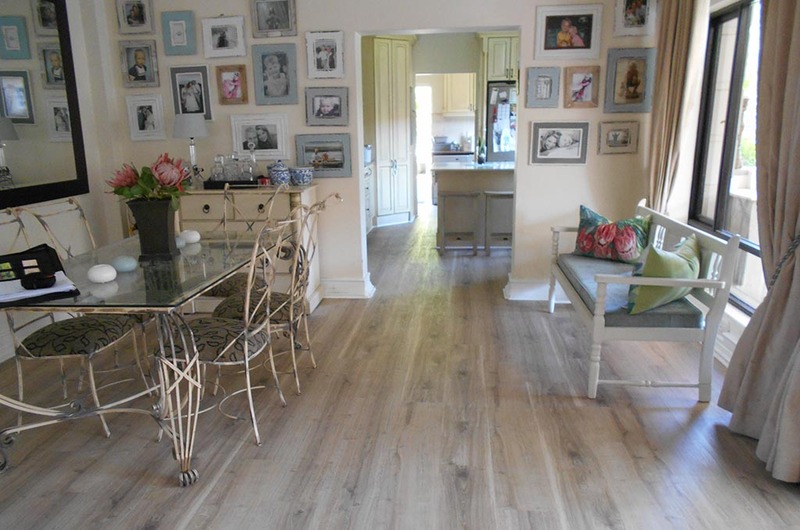 Laminate flooring still makes up a good percentage of the business and is sourced from European manufacturers. These range from entry level AC3 to satin and embossed AC4 flooring with either V groove or square edged planks. The latest very exciting addition is the new “Tru-Wood” AC5 laminate. Engineered to perfection, this large format plank is 12mm thick and is suitable for all commercial and residential applications. 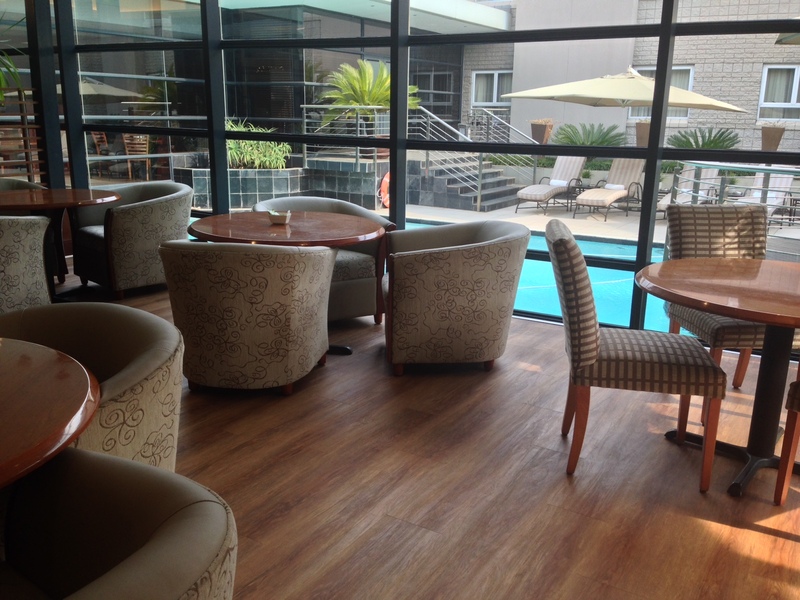 The use of Atroguard technology means this floor is highly temperature and moisture resistant. It can be wet mopped and used in wet areas such as Kitchens and bathrooms. 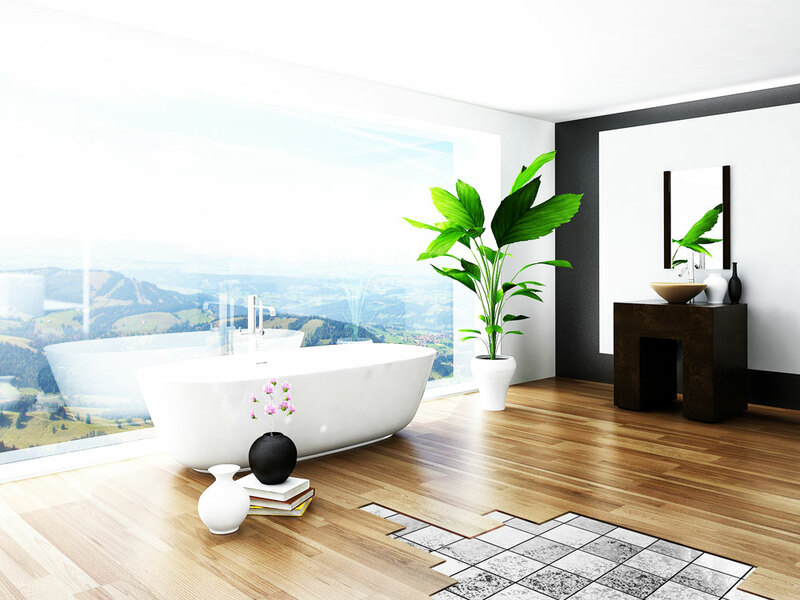 The biggest product revolution has however come in the form of vinyl flooring. 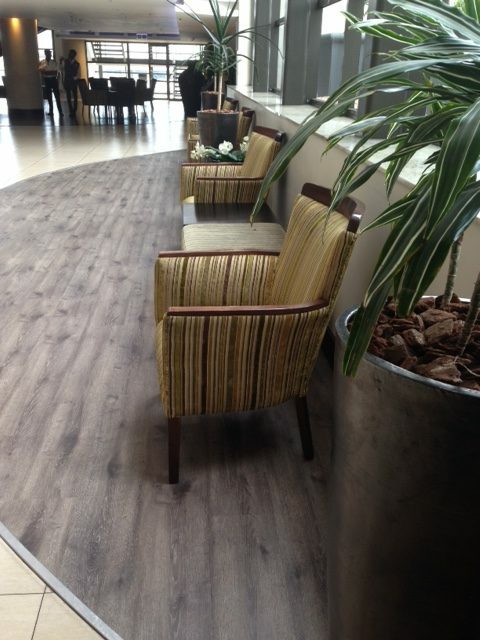 From early Grip Strip and Glued Down options through to the solid interlocking LVT’s, these products have enabled Traviata to capitalise on many commercial opportunities including hotels, offices, retail, hospitals, schools and upmarket residential. Today the latest generation of “rigid core” interlocking vinyl flooring including Firm Fit and IsoCore offer advantages never before seen in LVT flooring. They are rigid, extremely stable, completely free of plasticisers, Phenyls, PBB’s, heavy metals and are more realistic than ever before. Added advantages now come by way of sound reducing backers, anti-fungal / anti-bacterial treatments and advanced locking systems that allow greatly reduced installation times. 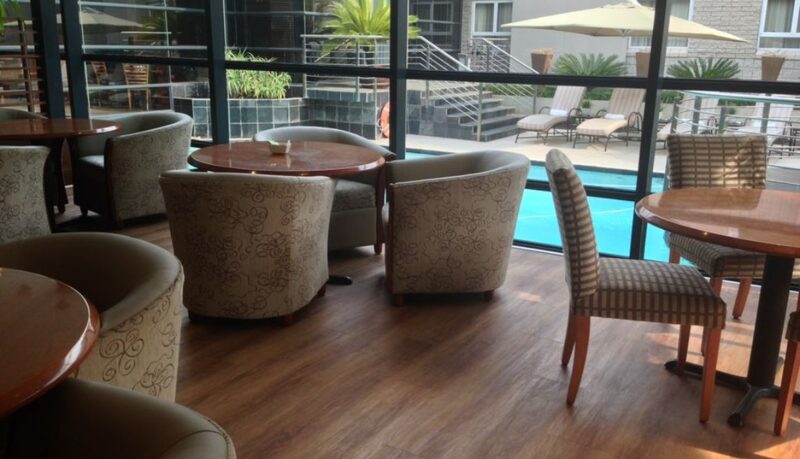 Traviata Flooring has become truly a global player in the local market and is spreading its reach further into Africa. A great number of existing buildings in the office, retail and hospitality sectors have existing tiled floors. The prospect of changing these conjures up images of noise, dust, rubble removal and a great deal of inconvenience and time. 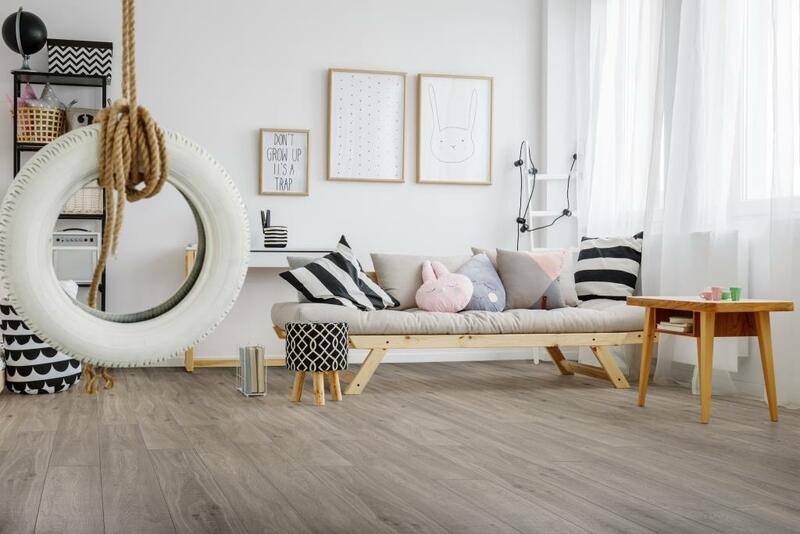 Traviata Flooring now offers a number of latest technology “Rigid Core” Luxury Vinyl and laminate flooring options which make upgrading of tiled floors quick and easy. Not only are these new floor boards incredibly stable but they are lighter and stiffer which allows then to be used over almost any firm surface, including tiles and raised and boarded floors. 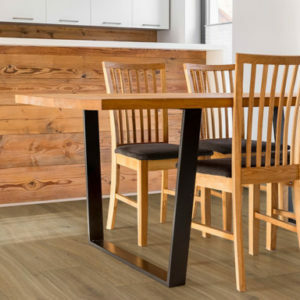 The rigidity of boards such as in the IsoCore ranges means there is no need for chopping out of old tiles or screeding – they can simply be laid straight over the existing floor. The process is extremely quick thanks to the latest top lock joint systems. More importantly there is absolutely no mess, no noise, no glue smell and no disruption to any neighbouring tenants. Spaces such as hotel rooms and retail stores can quite literally be upgraded and put back into service the next day. This is particularly important in the hospitality sector. The flip side of this is that these floors can be just as easily removed (and possibly re-used). For office accommodation this means spaces can be returned to “white box” condition quickly and easily ready for the new tenant specifications. Luxury vinyl and certain Laminates such as the Tru-Wood range are also either totally waterproof or highly water resistant. This means they can also be used in kitchens, bathrooms and other wet areas which often form part of the rentable space. 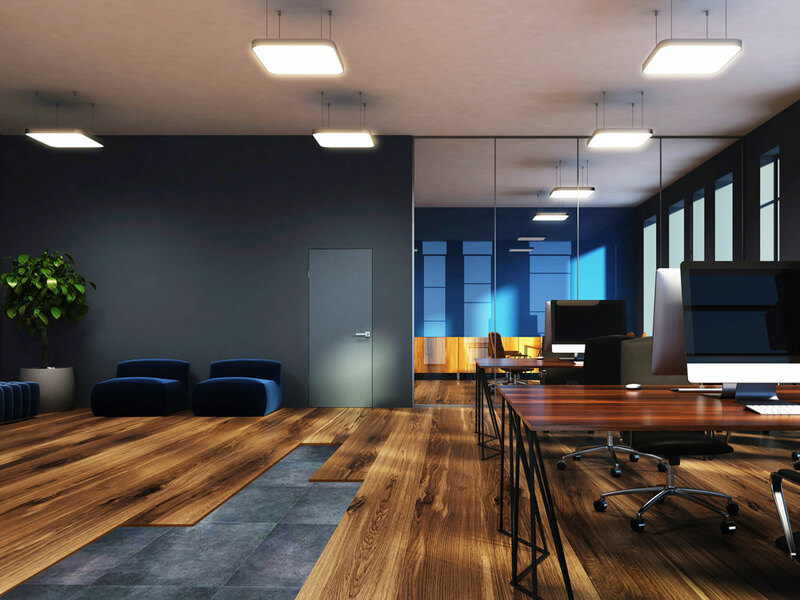 Floors are probably the largest single surface in any work place and as such have a major influence on both the aesthetics and productivity of the space. From a design perspective flooring can be used not only to achieve an overall look but can also be used to demarcate areas or to highlight activity zones. Todays “Rigid Core” and Glued Down Luxury Vinyl flooring offers everything from natural timber look to stone and masonry tiles and even solid colours and abstracts. 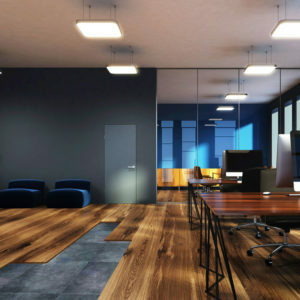 You could for example have a professional looking office space with a lively red, yellow and blue pause area or canteen. From a practical point of view floors can make a huge contribution to the health and productivity of staff. The newest technologies used in interlocking LVT flooring have seen significant reduction in both sound transfer and airborne sound. 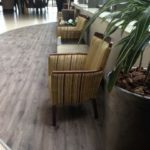 The Marriott Hotel group has for example done tests showing that the floor to floor sound transfer results for the IsoCore type of LVT are in fact better than carpet. There is a move now towards measuring the Indoor Environmental Quality in work spaces. 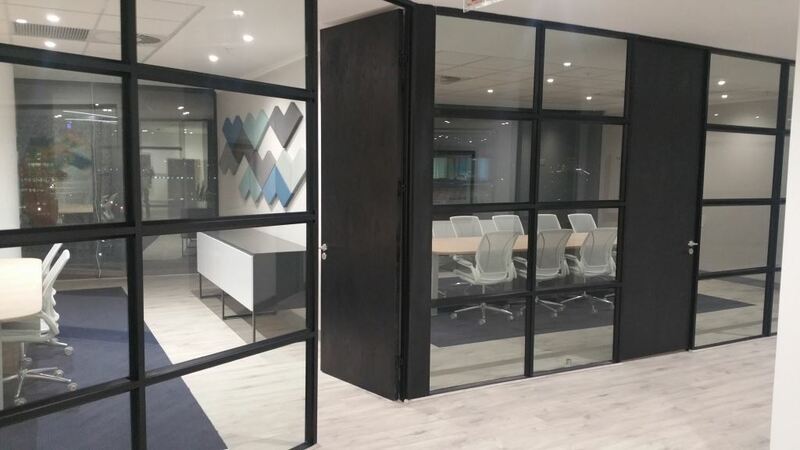 Noise levels together with air quality and lighting levels have far reaching effects on the health and productivity of occupants and therefor on the bottom line. As reported in a local Flooring journal, the Green Building Council is looking to recognise this and award Green Star points for compliant buildings. The light weight and rigidity of the new Rigid Core LVT’s also offer a leap forward in terms of renovating spaces. Existing tiled areas can e.g. be upgraded without the inconvenience and disruption of removing the existing surface. You can go directly over the existing tiles and quite literally be back in business the following day. Any of the Traviata LVT options will give you great looks, a healthy environment and a floor which is simple and cost effective to maintain for years to come. 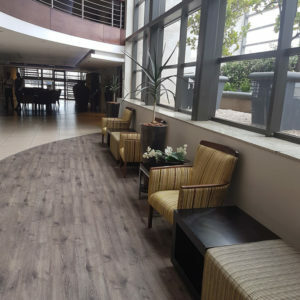 The newest ranges of “rigid core” and “glued down” LVT’s (luxury vinyl tiles) bring not only design flexibility, but also a number of practical solutions that are changing the hospitality, medical, education and residential markets across Africa. 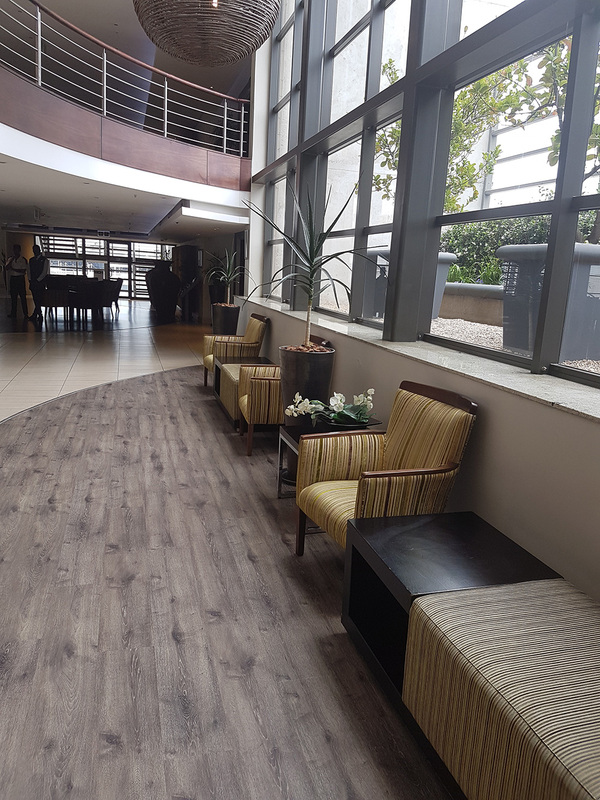 The City Lodge Group is one of the brands that has recently specified Traviata’s LVT flooring products in upgrade projects in their City Lodge and Town Lodge brands. 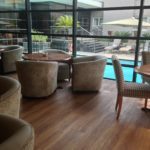 The company’s IsoCore products have been used in the front and back of house areas as well as the bedrooms in hotels in Johannesburg and Durban, and as far afield as Tanzania and Mozambique. 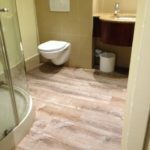 One of major benefits of specifying this flooring is the speed of installation. Bedrooms, as well as other areas, can be upgraded and back in operation the following day with no special floor preparation needed and no noise, smells or other inconvenience to the guests. Traviata’s IsoCore LVTs are warm under foot and have good slip resistance in wet and dry conditions, are resistant to most spills and stains, extremely easy to maintain and offer amazing sound characteristics. The Marriott Group in the US have approved IsoCore on the basis of its floor to floor sound transmission tests. The product has a 1,5mm IXPE backer, which is the source of the sound mitigating properties, reduces drum noise and offers better results than other soft flooring materials. 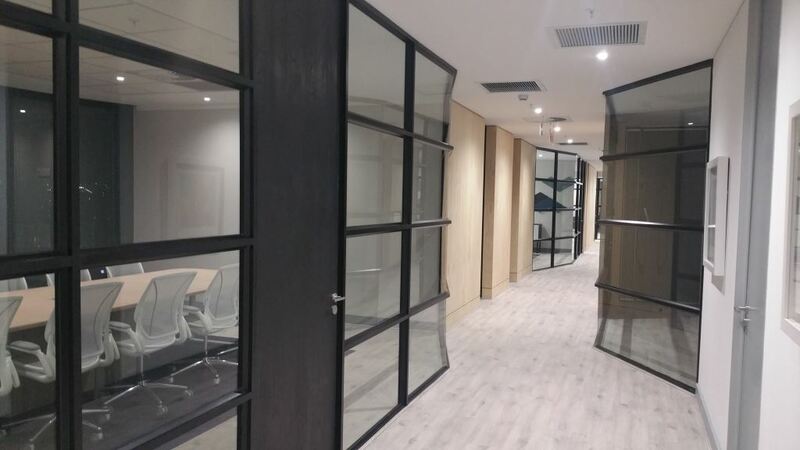 In South Africa, Traviata supplied this product Marriott’s new hotel in the yacht club precinct in Cape Town and to their new hotel at Melrose Arch in Johannesburg. Besides the characteristics of the IsoCore product that lend itself to medical environments, designers and clients are also specifying the product in hospitals to mitigate the sterile look. It is suitable for all areas except operating theatres and high care areas. IsoCore has been used in a variety of large hospital groups, private hospitals, clinics, old age homes, frail care centres and similar facilities. 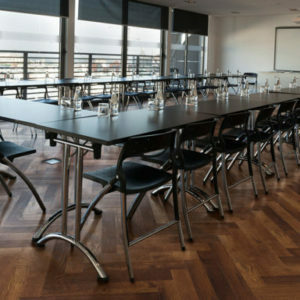 Glued down LVT’s remain popular for environments such as schools, with Traviata’s Elemental range being successfully used by the Pioneer school group. Patterned flooring and solid colour options are available in the Aspecta 1 range and are ideal for demarcating areas and creating fun feature areas while still maintaining all the benefits of LVT flooring in high traffic environments. 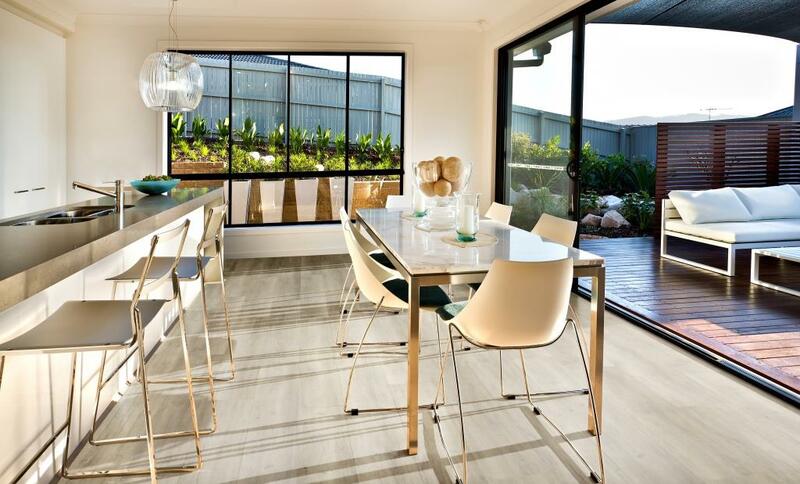 As a designer, you are undoubtedly accustomed to residential clients who want a floor that is waterproof, pet friendly, highly scratch resistant and can be used in any room in the house – even in direct sunlight. Firm Fit from Traviata fits the bill perfectly. The product’s limestone based core is twice as stable as normal LVT, three times more rigid, has ten times the impact resistance of e.g. a WPC floor and can withstand three times the static load. This product can be laid in areas of 400m² without the need for expansion joints, can be laid in direct sunlight and will never peak or telegraph sub-floor imperfections. Benefits for the installer and contractor include the fact that the joint strength is greatly enhanced and sub-floor preparation is not as critical as with other LVT products. Firm Fit has a foam backer for added comfort and sound reduction, and it is highly scratch and scuff resistant thanks to a quartz enhanced Urethane wear layer. The deep structured decorative layer gives designers the ability to offer clients the look and feel of a premium hardwood floor that is “Fit for Life”. Over the past year, this product has become increasingly popular, especially in larger multi-unit residential buildings and complexes. The new Firm Fit range called the “Elegant Line” is more budget friendly for large projects and individual homes alike while still offering all the benefits of the brand. Sawyer’s Flooring is a certified installer of all Traviata Vinyl and laminate products. They have recently specified and installed the Traviloc 5.0 in the Town Lodge Midrand laundry room. The Traviloc 5.0 is 100% Waterproof, slip resistant, colourfast, rigid, and hard wearing. All these qualities make it the ideal specification for a hotel Laundry room. Installation of the product is straight forward and simple. 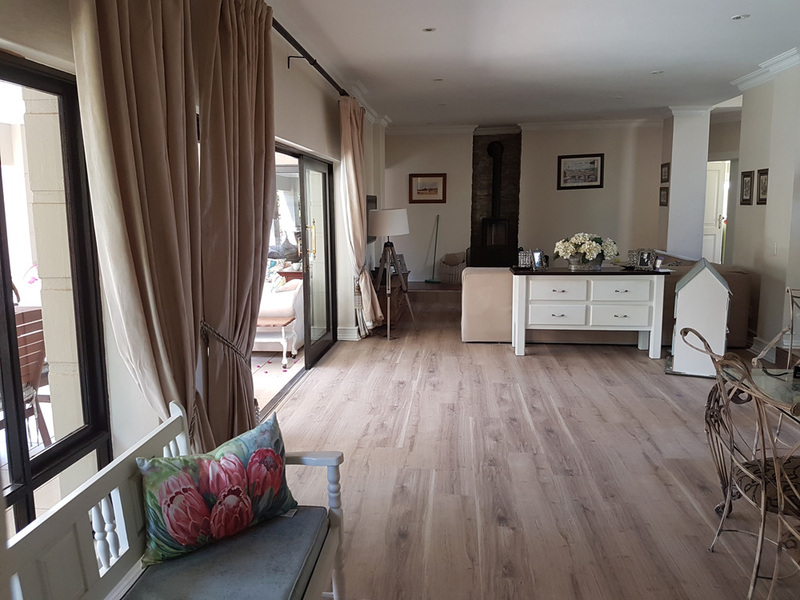 Sawyer’s flooring also do domestic installations and have specified Traviata vinyl and laminated flooring in many residential homes. 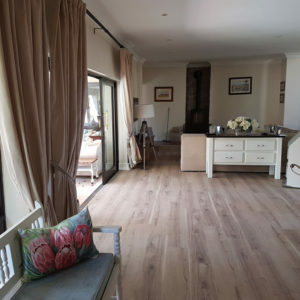 They have a showroom in Roodepoort in the West Rand, but will also see you in the comfort of your home, where you can have a look at samples and the consultant will advise you as to which will be the best Traviata floor for your home.